It used to be marketers could confidently dictate the rules of engagement with their customers. But the mobile phone has empowered consumers to decide on-the-go what they want, and how they want it; they decide how they will interact with a brand — if they even want to at all. With so many channels and mediums that bombard both the consumer and the marketer, how do you organize your strategy — let alone implement it — successfully? Enter: Integrated Marketing. Integrated marketing has evolved from a catchy buzzword to being the standard marketing strategy for many organizations. With today’s consumer constantly bouncing between channels, marketers must unify their messages so the consumer experience, whether online or off, is consistent at all times. While most marketers agree that an integrated approach is vital to their success, only 36% have actually taken steps to implement an integrated marketing strategy within their organization, and even those who have identified a strategy are still struggling to adopt success metrics. How do we know this? Through data, of course! 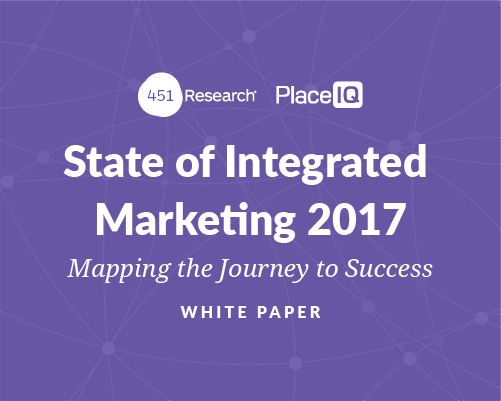 We recently released a report, State of Integrated Marketing 2017: Mapping the Journey to Success, that explores marketer’s current challenges, goals and opportunities when it comes to integrating their marketing efforts across channels. In partnership with 451 Research, we surveyed 200 US marketers about their current approach to integrated marketing — what we found was proof that if marketers plan to message cross-channel, they must measure cross-channel as well. Stay tuned for our next blog post where we’ll dive into our findings and examine what’s working, what’s not, and what marketers should be doing to achieve integrated marketing bliss.